We’ll have a full preview posted later today, but it’s the second event of the Le Mans Series this weekend, and the James Watt Automotive Porsche is back – in fact a ‘new’ James Watt Porsche, this one an ex-TRG 911 GT3-RSR. It’s the one run by Tech 9 at Silverstone and the Nurburgring last year, and was formerly owned by Pierre Ehret – who will be racing against it, again. “The driver line up will be Xavier Pompidou, Jack Elsegood and myself,” explains Paul Daniels. The Frenchman has had an on-off relationship with Spa recently: he and Marc Lieb sealed the inaugural (LMES) title in 2004, with a second place finish in Sebah’s ‘old lady’: the car wasn’t entered in the foggy 2005 race – but this pair went on to win the next three events and the 2005 GT2 title. Paul Daniels meanwhile had a big accident at Spa in 2004, in that dramatic September race, after contact from Christophe Bouchut. Bouchut won’t want to go mixing it with Jack Elsegood, because he’s a former Australian rugby league player. Elsegood is now a property developer ‘down under’, and the introduction to JWA came from Allan Simonsen, who raced the James Watt team’s GT3-RS last year. Simonsen and Elsegood have been partners in the Coopers Ale V8 Utes in Australia. Presumably this has to be Elsegood’s first race in Europe? Simonsen will be racing for Autorlando again, as he did at Istanbul – and presumably will be hoping for rain in the Ardennes, after his performances at Silverstone last weekend. “We tested the car at Donington recently and Richard Westbrook gave it a shake down and seemed happy with basics,” explains Paul Daniels. “We trust Xavier will help fine tune the set-up for spa. ”We are talking to Richard about driving with us in the Le Mans Series, and hope he can contest one or two rounds: however he is committed to Porsche Supercup and there are date clashes - starting with Barcelona this weekend, which ruled out a drive at Spa. ”The car has a 3.6 litre motor but we will go to the 3.8 for the next race: tyres will be from Dunlop. 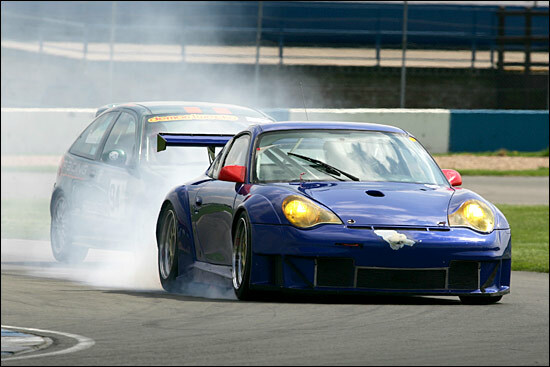 Here’s Richard Westbrook, trying out the brakes at Donington Park recently.